The Cleveland Cavaliers advanced to the NBA Finals with a 113-87 win at Toronto last night. The Oklahoma City Thunder are in a prime position to join them with a 3-2 lead in the Western Conference Finals against the Golden State Warriors and homecourt advantage here in Game 6. The Warriors saved their season with a 120-111 win Thursday night in Oakland, and a victory tonight would put them in driver seat with a deciding Game 7 at home. Golden State did not stand much of a chance in the first two meetings at Chesapeake Energy Arena, losing 133-105 and 118-94. “It will take all of our IQ, all of our gamesmanship, and just 48 great minutes to get a win down there, considering how the last two games have gone,” Warriors guard Stephen Curry said. Curry scored 31 points on 9-for-20 shooting to fuel the victory in Game 5 and will have to be at his very best again tonight for the Warriors to stand a chance tonight. 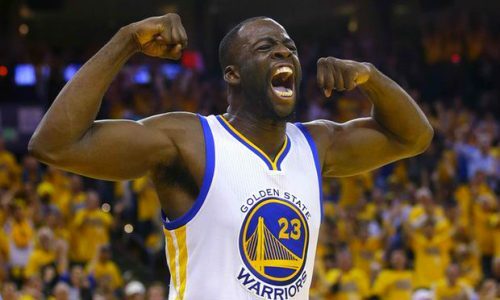 The Warriors will also need the Draymond Green that delivered 11 points, 13 rebounds, four blocks and only two turnovers in Game 5 to show up. Kevin Durant contributed 40 points and Russell Westbrook added 31, but the star duo did not get much help from the rest of the team in Thursday’s loss. Oklahoma City lost the battle of the boards 54-50 in Game 5, and the key to its success is to dominate the paint again. In each of the Thunder’s three wins they’ve outrebounded the Warriors while Golden State has won or tied in that category in both of its wins. Warriors are 5-2 ATS in their last 7 games playing on 1 days rest. Warriors are 1-4 ATS in their last 5 after scoring 100 points or more in their previous game. Warriors are 1-5-1 ATS in their last 7 Saturday games. Warriors are 0-4 ATS in their last 4 games following a straight up win. Thunder are 4-0 ATS in their last 4 home games. Thunder are 6-1 ATS in their last 7 games following a ATS loss. Thunder are 12-3-1 ATS in their last 16 games following a straight up loss. Thunder are 18-7-1 ATS in their last 26 when their opponent scores 100 points or more in their previous game. Warriors are 0-5-1 ATS in the last 6 meetings in Oklahoma City. Home team is 15-5-1 ATS in the last 21 meetings. Over is 7-2 in the last 9 meetings in Oklahoma City. Golden State has not had much success in Oklahoma lately, but the Warriors have proven more than once that they’re the team to beat in the NBA, being reigning champions and all.